Just wanted to pop in and say a quick hello and give you a few updates. I have been hiding in the Craft Room Cave all weekend packing up orders, emerging only to feed my baby and eat the occasional snack of conversation hearts and grapes. George helped me immensely and measured out yards upon yards upon YARDS of ribbon and seam binding, and (as seen here) typed up shipping labels on my very messy glitter-covered craft table, and cooked dinner, and even drove to Chick-Fil-A at 9:00 pm when I was dying for a Sweet Tea. Thank you, babe. I think I'm gonna keep you. 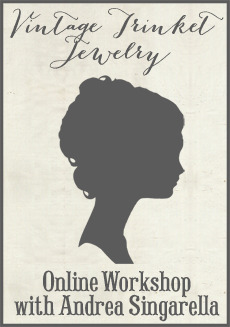 OK, back to shop talk.......the Spring goodies will be listed on-line this Thursday, Feb 14. Originally, I had scheduled the Spring launch for the 12th, but I want to get all of the opening week orders processed before listing new items. Speaking of orders, anyone who placed an order last Monday or Tuesday, your order has shipped! All other orders should go out by tomorrow (Tuesday). Thanks for your patience with this first very busy week! It looks like something from a "is your life out of control?" commercial, doesn't it? It's just insane how many electronic devices I have plugged in here: computer, printer/fax/copier, wireless router, surge protector, telephone, 4 lamps, OTT light, glue gun, soldering iron, ipod docking station/radio thing, breast pump and who knows what else. Insanity, I tell you. No wonder our electric bill is so high. Anyway, that's it for now. It's late and I must go to bed. My eyes are starting to cross as I stare at this screen. I'll be back on Wednesday! Please be careful with all those cords. :) Your hubby is a real doll for helping out, but mostly because of the sweet tea run. Happy to hear your first week back in the store was so successful! We want to keep you around so you can keep supplying us with all of your amazing goodies! Whta a sweetheart George is - definitely a keeper. I am so impressed by your lack of dust on your cords!! Mu hubby is an engineer and I actually have to dust all of them!! Take care of yourself my dear. I'm trying to learn that if I don't do that first, nothing else really goes right. Still learning though, it's hard! Ah! Yes! That wonderful breast pump that is attached to your hip for those first few months. Gotta love it! I just wanted to thank you for the quick shipping!! You only opened last Monday and I had my goodies by Saturday!! Like a little Christmas...love your stuff. I have ordered from other people before you and still don't have that stuff. Can't wait until the 14th!! George is a keeper! That's what it looks like under our desks and behind our television too! Good thing you have George!!! Hope your tea was good. Looks like my craft room. Have I ever told you that our husbands have the same hairdo?!! It's such a blessing to have a supportive husband who is happy to help out. I have a little space in an antique mall here in town. I can't tell you the number of times my husband has taken seats out of our van (we need a truck) and hauled flaky paint furniture all over town for me. I couldn't do it without him. By the way, as good as Chic-Fil- A's tea is I would have opted for a vanilla shake! Yum. Do you ever un-plug the wrong thingy (and then start walking away with the item you THOUGHT you un-plugged)??? LOL! 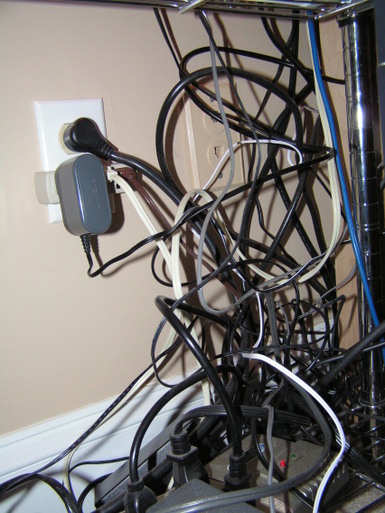 Hi Andrea...I think everyone has at least one of those clumps of cords somewhere! I just got the flashcards...thanks so much and don't work too hard!!!! Your hubby looks too cute siting at the frilly girly desk. The underneath of my desk looks the same. Cant wait to see what you have in store for us. Oh my! If I lived closer I'd pop right on over to help you out. I recieved my order but am waiting until I'm back in work next week to open it - I have a co-worker that is a big fan or your blog and shop and I promised to save my package to open with her! So nice that your husband is able to help you!!! Those cords.... I think we all have that mess under our desks, I am always looking for ways to keep them organize, but I have not found a way that totally works for me yet!!!! you poor dear...maybe you should have something other than conversation hearts and grapes...like chocolate! i cant wait to see the spring goodies!! Glad you have George to help you!! Received my order today and i can only say I LOVE IT ALL!!! I'm excited to see the spring goodies!!! What would we do without our loving husbands? I'm glad that you got everything under control and I'm also glad to see that someone else has lots of tangled cords under the desk! Here I was thinking I was the only one who could have such a mess! Thank goodness for a helpful hub. Hope your computer is better. Glad you have such a great guy to help! :). I'm so glad that your re opening was such a huge success! Everything you offer is always beautiful, fun and the best. Underneath my desk it looks just like that, only with dust here and there. I justgot my first order of the Flashcards and Twinkling Corsage pins!! They are FABULOUS!!! I have to say that when I opened the pkg., how you have wrapped everything, made me feel like I was opening a birthday gift from my best frind! How you pkg everything is just beautiful and fun!! Ill be back for more! Cant wait to see what the Spring goodies are! !